As you know, most of my books are available in print format as well. I use Createspace for this but have often flirted with the idea of using Ingram Sparks. How can one choose? I recently stumbled on a great post by Giacomo Giammatteo on the Self-publishing advice blog. Giammatteo has posted a great comparison that details the pros and cons of each choice. The following table compares various features to explain the difference between the two services. 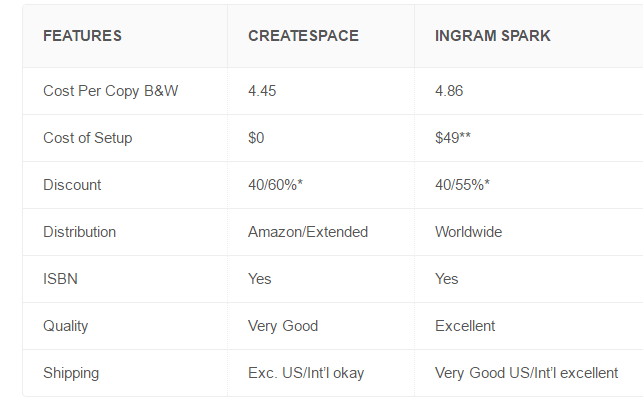 Two important factors emerge right away: Ingram Sparks has a setup fee of $49, while the book ends up 41c more expensive. So, price-wise, Createspace is a winner. However, the book’s quality is somewhat lower, and distribution depends on Amazon. Distribution is an important point: if you’re planning on distributing into brick-and-mortar stores, you’ll earn the same profit everywhere. With Createspace, you may be looking at a $4.55 profit if selling on Amazon, and at a mere $1.55 if selling elsewhere. That’s a big difference. It’s also time to put another myth to rest: that bookstores won’t stock books from CS because they are owned by Amazon. As with every myth, however, this one has a kernel of truth: few bookstores will stock Createspace books because of economics: CS charges the author 60% for expanded distribution, but the bookstores only receive about 25%. For a more detailed breakdown of the pros and cons of each service, check out the two-part post on his site and the original post on selfpublishingadvice.org. For Australians Ingram Spark is better because the books are printed and sent within Australia. We used Createspace originally for Angel with Drumsticks but if we wanted to purchase copies for resale ourselves we would have had to pay international postage on them. We have also received excellent service from Ingram. I didn’t know that, thank you for letting me know! It’s the same with Greece,a actually. International postage isn’t too bad, but it’s so slow I often order mine from Amazon UK. Thank you for sharing this information. This was very helpful information on the options of print on demand and distribution. Sure, that’s another way of doing it. It might be a bit expensive for some Indies, though. Thank you Nicholas. I have often heard of Ingram Spark but, understanding there were costs involved (I have little in the way of resources for book publishing), did not pursue any investigation. The very clear and thorough information in this post has now provided me with further understanding. Like you I publish my paperbacks with Createspace but will. also, now consider whether Ingram Spark would be of use to me. Thank you again for sharing. That makes me think that you get what you pay for. I guess there’s some truth in that. Everything’s a cost/benefit analysis. Hello I did not see the page length for the figures you are showing. Maybe I missed that. Great info otherwise.